Taking into account the formal fashion trends, it becomes significant to highlight styles that are most striking and offer versatility to the already in vogue list of attires. Men’s formal fashion has definitely experienced a gust of new approach which has offered a more mod-scot impression to their dress code for formal needs and simply makes one ambivalent over what to opt for. Churning and brewing fast in the mainstream of style and personality development, designers have now invested a great deal of their talent in the men’s formal fashion trends and allowed them to step out of their down-version state of simplicity and tune in to something more remarkable. Out of the bundle of trends introduced this season, a lot has loomed out with respect to modernity in the formal fashion for men which have broadened the ambit of designs that are now at disposal. Contributing to a more promising wave of trend that will definitely run for a long-term are the mid-century corporate formal getups which feature fitted coat styles with skinny pants. There has been a lot of focusing on the designs and styles of coats, pants and blazers, which have been bound by artistic touches of embellishment through fancy collar styles, dramatic button adornment, color fusions and much much more to dish out an ocean of formal fashion suits that are indeed up to the mark and expectation. Gone are the days when you world find creativity and grace of presentation in the women’s fashion list only. Running parallel to the modernized trends of women, men too have a vast list of latest Formal Fashion styles that has offered them to hone out lively and well adorned formal looks. Offering more class to the formal pants is the new ruffled suit pants are some of the new modifications in the traditional mid-wide dress pants that offer a chic and young presentation perfectly apposite for official use. The print fashion continues to storm the latest fashion trends with its tropically colorful impact. In the formal fashion trends for men, there is a mind-blowing myriad of shirts that have contrasting block colored sleeves with print shirts or are worn sensationally below a mid-waist coat to offer a young businessman look at its best. Never to fade into the background are some of the eternal shades that are in fact the pillars of men’s corporate attires. Stamped down as the masculine shades, Black, blue, gray and beige continue to swarm the top lists of hues for men’s formal fashion. 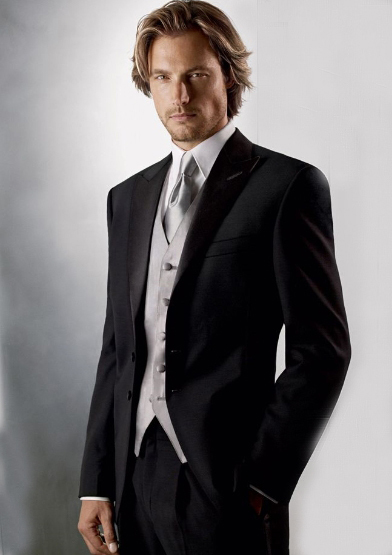 However, it’s not merely single full block colored formal fashion suits we are talking about here. In fact inducting a more colorful presentation is the inclination of pairing up different colored pants and formal coats. There are some classy shades for the formal corporate suits for men such as magenta and off white, red with black, blue with white, yellow with white and the list simply goes on. While focusing on the trend in accessories to harmonize the men’s formal fashion, there are some vibrant inclinations of shades in printed and block colored ties to offer a dazzling and striking combination to the plain colored suits. This trend is all the more apposite for the young generation to be simply at their best at offices, parties, dates, proms and even weddings. It’s really a sensational list of trends that has hundreds of rousing styles that can really perk up the formal look of men.